When you first set up your early learning service, you can upload multiple children really quickly. Just follow the steps below. 1. Go to your early learning service's ‘Children' page. 3. Under ‘Step 1’, download and open the spreadsheet template provided. 4. 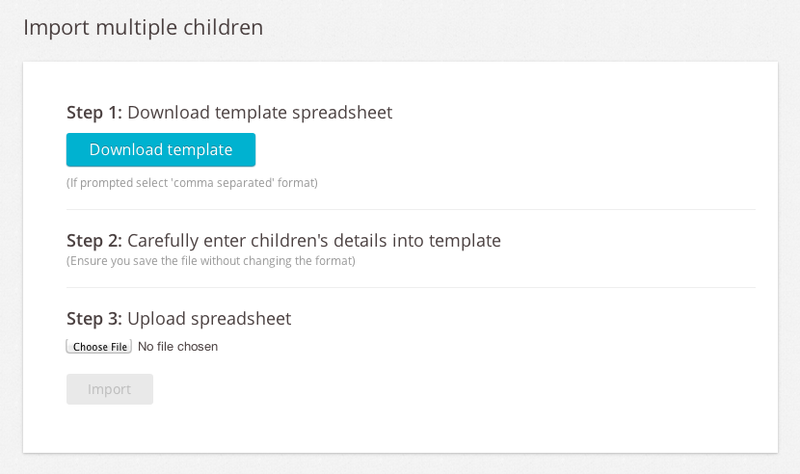 Under ‘Step 2’, begin adding your early learning service's children to the template on row 2 (underneath the headings), making sure to follow the format provided exactly. Make sure the dates are entered in the format DD/MM/YYYY. If your format differs or the field is left blank, it will result in an error. North American (YYYY/MM/DD) or Japanese users (MM/DD/YYYY) who have exported from another system will need to change the format of the Birthday column to UK or Australia. In Excel, select the cells you want to format and press CTRL+1. On a Mac, press Control+1 or Command+1. In the Format Cells box, tap the Number tab then in the Category list, tap Date. If you want to use a date format based on how another language displays dates, pick the language under Locale. Learn more about using Excel. Or, Learn how to do it using Google Sheets. When you’ve finished click ‘Save’ – it must be saved in the same format provided (a .CSV file). 5. Under ‘Step 3’, click the ‘Choose file’ button and find the template you’ve just edited (check your computer’s ‘Downloads’ folder if you can’t find it). 6. Click the ‘Import’ button and wait for the children to be imported.